The monastery dates back to 1711. In earlier times, the monastery possessed considerable wealth. It even owned its own ship that conducted private business for the benefit of the monastery. At the same time, it was an active intellectual and patriotic influence. From 1806 to 1845 it ran a school where the Greek language and literature were taught. The monastery's decline began in 1860, and buildings later suffered serious damage in the earthquake caused by the earthquake of 1956. Today the monastery has a museum with an important collection of ecclesiastical items, books and ethnographic material. There is a collection of local & Cretan portable icons (Hagiographies), wooden sculpture, metal art works and embroidery, dating as far back as the 17th & 18th century. It also hosts displays on shoemaking, printing, candle making, wine making and of typical local food. 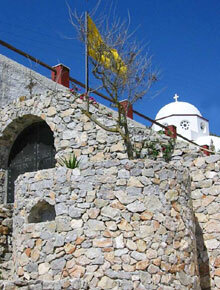 The museum is housed in Agia Triada which was originally a Catholic church belonging to a small convent.